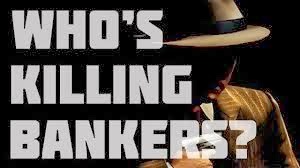 The JPMorgan linked deaths are piling up as yet another death is added to the tally, bringing the official number to 13, yet when lower level banksters are added in, that number tops twenty, and yet official causes of death are either unknown, ruled accidental or “suicides,” despite previous warnings, by “V” The Guerrilla Economist via Steve Quayle, of an actual hit list with over three dozen names on it was revealed after the fourth mysterious banker death. The man that struck and killed Giampapa was 78 years-old, and while it is unimaginable that he had anything to do with some type of hit squad, the death of ANOTHER JPMorgan employee also cannot be ignored. The chart below the video was made by a Wake up America reader, color codes explained above the chart. More from Christopher Greene at AMTV, below. The teal boxes are the dead bankers, after the bankers name is the method of death. The big orange oval is the scandal of the banks doing currency manipulation and if you look all but three of the dead bankers seem to be directly or indirectly tied to the scandal. Richard Talley — He’s the one who shot himself multiple times with a nail gun. His company was being investigated for robosigning mortgage documents but I can’t find any ties to the other players. Autumn Radtke — She was CEO of First Mehta which is a currency trading company that trades online currencies for real currencies, it’s likely she is connected as it’s currency trading but she also was featured a year ago in an article about where she admitted she had suffered suicidal depression her hole life. So it’s also possible she did commit suicide after all, especially since she lost a fortune when the bit coin trading center in Japan closed down. Edmund Reilly — I can’t find much about Midtown Vertical Group other than they are a funding company that provides money in exchange for share in bio-medical companies. http://www.vertical-group.com/current-portfolio.html He was going through a very nasty divorce and the day before he jumped in front of that commuter train he had found out how much his exwife and kids were getting in support payments.